Mount Mayon has been acting up for more than a week, ejecting ash and lava fountains nearly two miles from the crater. The Mayon volcano spews ash and lava on Jan. 25. Mayon's unrest has displaced more than 75,000 people and officials are bracing for a humanitarian emergency they fear could last for months. There have been no reports of injuries and law enforcers have struggled to keep villagers and tourists from sneaking into danger zones. 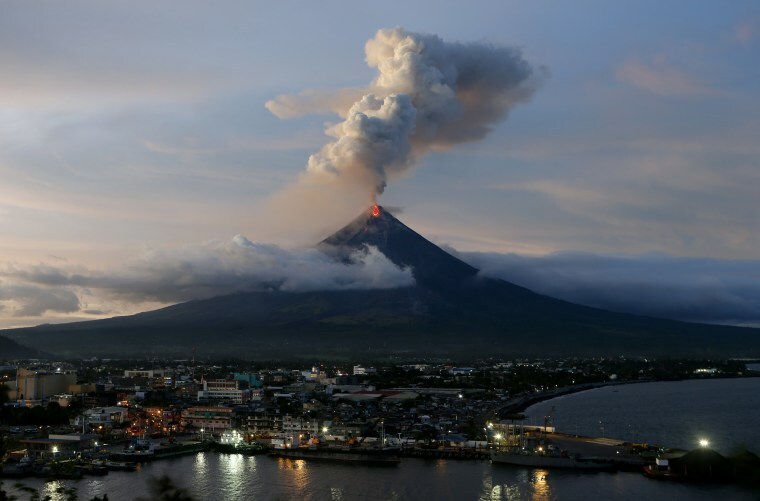 The Mayon volcano erupts anew at dusk on Jan. 25. Legazpi City is in the foreground. 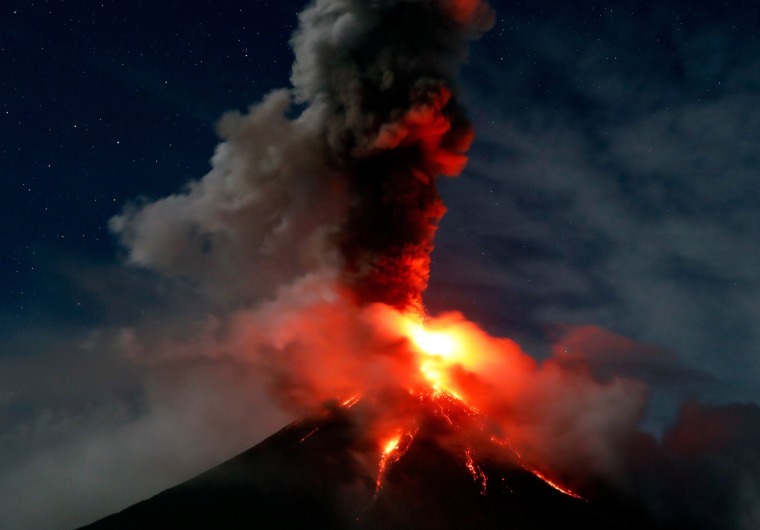 Pyroclastic flows — superheated gas and volcanic debris that could incinerate anything in their path — reached 5 kilometers (3 miles) from the crater in one area, the Philippine Institute of Volcanology and Seismology said. 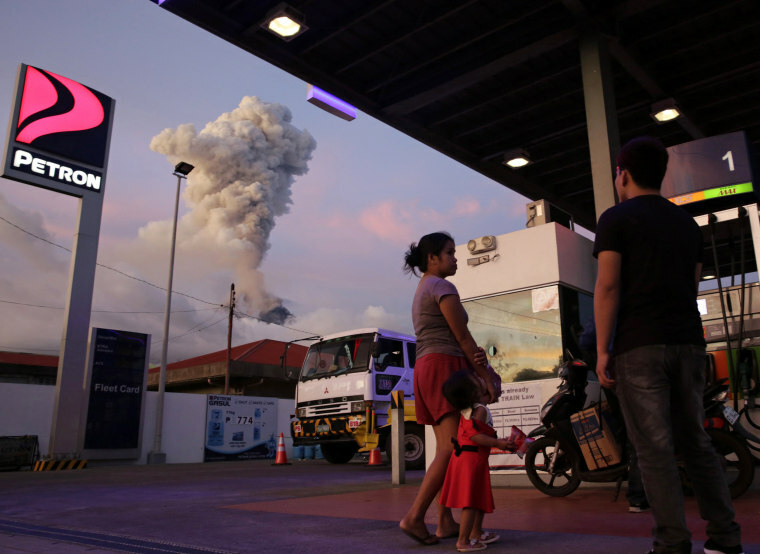 People standing at a gas station in Daraga, Philippines, watch the eruption of Mount Mayon on Jan. 25. Although Mayon has erupted about 50 times in the last 500 years, sometimes violently, it has remained popular among climbers and tourists. The sun sets behind the volcano on Jan. 25. 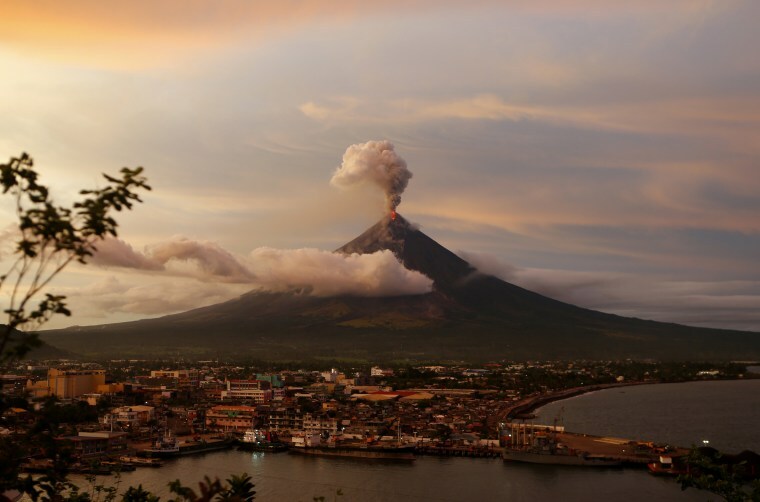 The Philippines, which currently has 23 active volcanoes, is situated on the so-called "Pacific Ring of Fire," an area known for its intense seismic activity which extends from the west coast of the American continent to New Zealand, Japan, the Philippines and Indonesia. 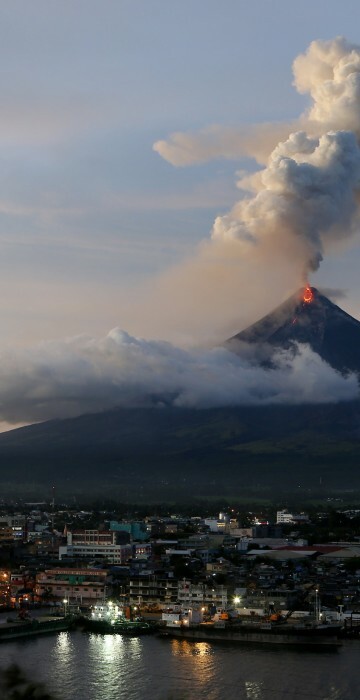 Mayon volcano spews red-hot lava on Jan. 24. The Mayon volcano lights up the night sky over Daraga on Jan. 24. A resident wears a face mask to protect himself against falling ash on Jan. 23. Ash spews on the slope of the Mayon Volcano in the town of Daraga on Jan. 23. Villagers are evacuated on Jan. 23. Lava cascades down the slopes of the volcano during the second successive day of eruptions on Jan. 23. Filipino villagers evacuate along a road covered with ash on Jan. 22. A huge column of ash shoots up to the sky on Jan. 22. Filipino school children walk at the foot of the volcano on Jan. 19. A member of a monitoring team with the Philippine Institute of Volcanology and Seismology displays a graph of the volcano in Legaspi city on Jan. 18. Soldiers and government employees prepare relief goods to be distributed to evacuees affected by the eruption on Jan. 18. Residents who evacuated from the region get a ration of rice inside a public school on Jan. 17. Children fish under the shadow of the volcano on Jan. 17. Filipino evacuees take shelter at a school in the town of Camalig, on Jan. 17. Filipino villagers maneuver with their belongings along the slopes of the rumbling volcano on Jan. 16. Clouds partially cover thevolcano's crater as it spews a column of ash during another mild eruption on Jan. 16. A villager rides a water buffalo along the slopes of the volcano on Jan. 16. The Mayon Volcano lights up the night sky with flowing lava, Daraga, on Jan. 15.